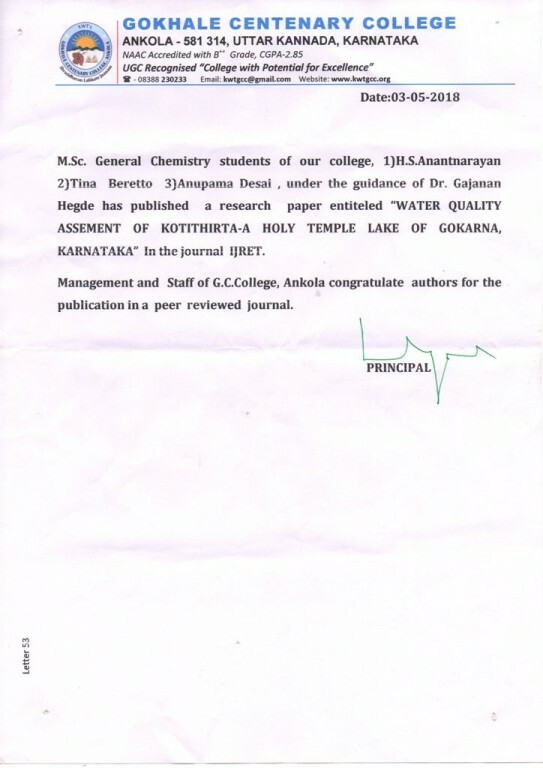 Letter of Appreciation-For a publication in a peer-reviewed journal. DADABHAI NAOROJI LIBRARY AND INFORMATION CENTER. The college was established in June 1966, the birth centenary year of Gopal Krishna Gokhale and is named after him. The college is permanently affiliated to Karnataka University, Dharwad. It has Arts and Science faculties leading up to the final year degree courses. The college has an independent building. Besides, it has a canteen, a cycle shed, an indoor games hall, a Student Consumer Society and an administrative wing. There are six Staff quarters in the campus. The chairman's quarter serves as a guest-house of the college. The college has well-equipped laboratories in Physics, Chemistry, Botany and Zoology. It has a separate and spacious Library Building, named after Dadabhai Naoroji. The college office is equipped with latest computers. Gokhale Centenary College © 2019. All Rights Reserved.